This photograph was taken 148 years ago today, when the last spike in the First Transcontinental Railroad was driven at Promontory Point in the Utah Territory. Not shown are the 10-15,000 Chinese immigrants who made up the majority of the workforce that laid nearly 2,000 miles of tracks, blasted through mountains, and dug the tunnels that joined the east and west coasts of the United States. Many of the Chinese workers were brought over from China explicitly to work on the railroads. Hundreds died. In 1882, 13 years after the railroad was complete, President Chester A. Arthur showed his appreciation by signing the Chinese Exclusion Act, which banned all Chinese immigration in the U.S. It would remain in effect until 1943. 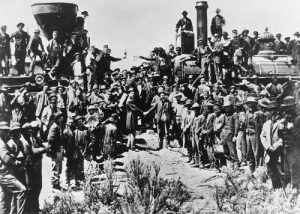 On May 10, 1886, 17 years to the day after the First Transcontinental Railroad was completed, Chinese Immigrants won a major victory for civil rights in Yick Wo v. Hopkins, in which the Supreme Court ruled that even though they are not citizens, immigrants are still entitled to equal protection of the law under our Constitution. Learn more about Yick Wo and Chinese immigration to the U.S. in our film Yick Wo. and the Equal Protection Clause. The DC Asian Pacific American Film Festival has announced their awards for 2010. Yick Wo and the Equal Protection Clause has been named Best Documentary Short. It will screen this Sunday at 2pm, along with five other short films, including Jitensha, the film named Best Narrative Short. You can read more about Yick Wo and the other winners here.